Could this be a cast-iron, Art Nouveau, 1920s/1930s fire alarm box stripped of its "cool front doors and insides [and] replaced with modern and efficient communication equipment"? 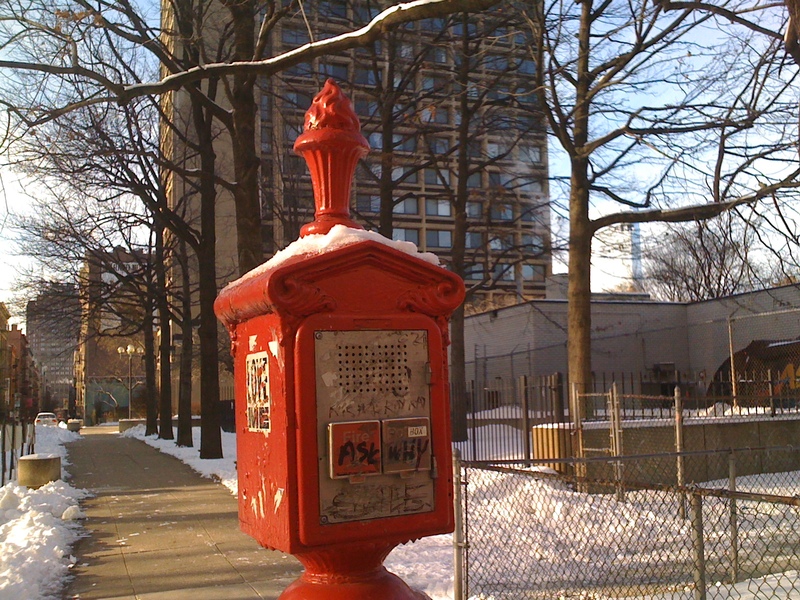 Check out a New York City Fire Department call box restored by Vintage Vending. 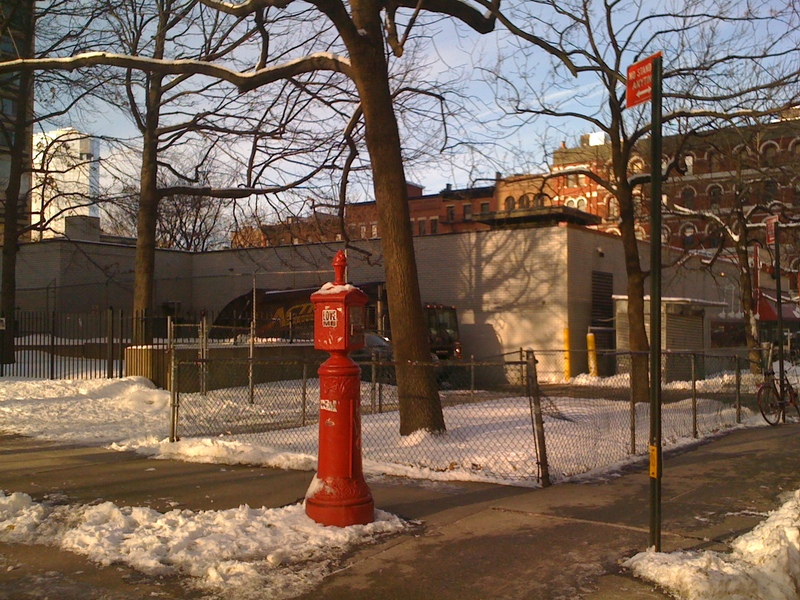 The call box pictured here is located on Bleecker Street between LaGuardia Place and Mercer Street. The box has two call buttons -- one for fire and the other for police. 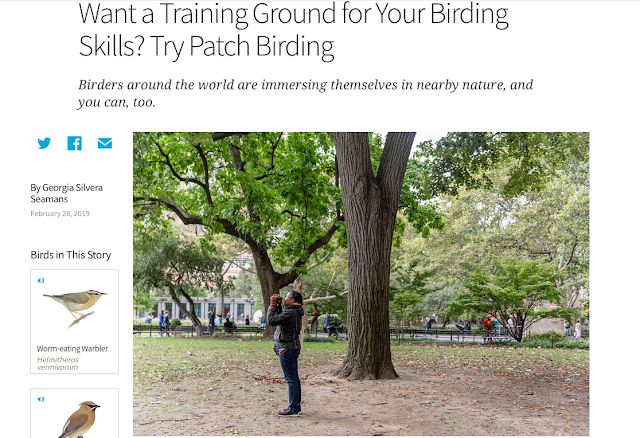 The second most common method is by means of F.D.N.Y. fire alarm boxes in the street and in certain public buildings such as schools and hospitals as well as highways, bridges, etc. These consist of the following primarily two types. The first is mechanical boxes, also commonly called pull-boxes or telegraph boxes in which a spring-wound mechanism alternately opens and closes an electrical circuit thereby rendering a coded number linked to the specific location of the box. Until the advent of the STARFIRE Computer-Assisted Dispatch System (CAD), dispatchers had to physically count the taps from mechanical boxes when they were received in the central offices. Today, a "Box Alarm Readout System" (B.A.R.S.) display handles that aspect of the job. The second type is the "Emergency Reporting System" (E.R.S.) boxes that are equipped with buttons to notify either FDNY or NYPD, allowing either department's dispatcher to have direct voice communication with a reporting party. E.R.S. boxes began to replace mechanical boxes in many areas of the City beginning in the 1970s. Moses Farmer, an engineer, and Dr. William Channing, a physician, invented "the world's first municipal fire-alarm system" which was installed in Boston in 1851. During his tenure as New York City's mayor, Rudolph Giuliani's attempted to remove the city's alarm boxes but his effort was thwarted when a court ruled, according to the Boston Globe and Forgotten NY, that doing so would violate the rights of the deaf community. Moreover, the alarm box system is operable during power outages and is unaffected by problems with telephone or radio transmission. During a two hour 911 system crash in New York in March 2004, a serious fire in Brooklyn was called in on a fire alarm box. Thank you to a 150 year old technology. Does your city still maintain its street-side fire alarm boxes?